With shining new megapixel cameras to uplift your capturing artworks, the robust iPhone 8 also upgrades the size of each photo than ever before. If your machine gets crashes and retardations more in frequency, how to transfer photos from iPhone to Mac is an urgent and imperative task to address right away. Here we introduce 2019 top 6 ways to transfer photos from iPhone to Mac/iMac/MacBook Pro/MacBook Air running macOS Mojave/Sierra and earlier. Proceed to find your answer. New functions to help transfer photos from iPhone 8/7 to Mac/MacBook/iMac to be added soon! Migrating from its web version, WeTransfer now provides an iOS APP to transfer photos from iPhone 8 to Mac without cable. As long as you download the Wetransfer APP from APP Store, the UI greets you right away with a hotspot to upload photos & then a dialogue box to type an e-mail address(es) to transfer iPhone photos to. 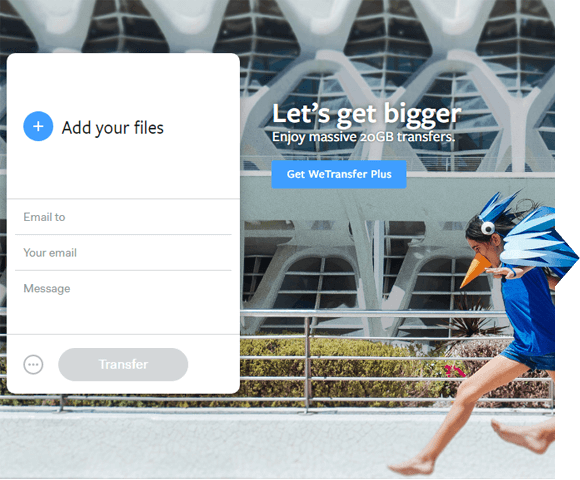 Unlike its web-version photos transfer service, Wetransfer APP now supports up to 10GB free upload each time, with a follow-up email alerting you when the recipient has downloaded your files on Mac. That been said, all you need is to upload photos on iPhone 8 & sign in with your own email from Mac. Pros: No registration needed, you can use WeTransfer app from any device & upload to transfer photos from iPhone to Mac. Cons: Compared to the websites version of Wetransfer, operation on iOS is less intuitive. 10GB transfer limit for basic users. Wetransfer APP crashes? Check out best way to backup photos. If you happen to receiver an image file that won't open on Mac, chances are that it's in HEIC HEIF format which doesn't show up on ANYTHING before macOS High Sierra. So you need either to upgrade to High Sierra or try on one of the best HEIC converters 2019. With a Mac model released after 2012 and an iPhone 5 or newer, AirDrop can help you easily transfer photos from iPhone 8 to Macbook: Please keep your iPhone and Mac within 300 feet of distance from each other, uncheck Mac's firewall which blocks all incoming connections, then keep iPhone 8 and Mac connected to Wi-Fi (not necessarily the same), while also turn on Bluetooth, and the AirDrop on iPhone 8's control center. After this, set share scope to Contacts Only or Everyone on iPhon. For Mac, you can turn AirDrop on through Finder > Menu Bar > Go > AirDrop so as to match them up with each other. Manually check all the photos to import to Mac on iPhone, and you'll see a window popping up on Mac screen prompting you to receive files from iPhone, click accept to start. Pros: Auto-convert HEIC for uncompatible devices, support transfer between different Wi-Fi. Cons: Distance restrictions. 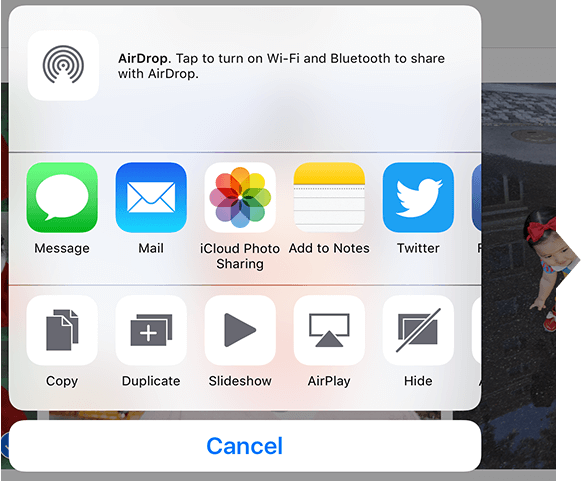 You're not going to transfer photos to a distant Mac using AirDrop. A bunch of iOS APPs with embedded Share Function allows you to directly send any photos, pictures & screenshots from iPhone to Mac using your Apple ID's address as the sender. This helps you get a copy of sent photos whenever you want, wherever you are as long as you are logged-in with the Email account and keycode. You won't need to worry if the photos were deleted somehow by mistake, just re-download the photos transferred from iPhone to Mac. Using the embedded Email transfer function also has its own limits, for example, most commercial mail service provider only grant 50MB of attatch file size limits for basic account, and the temporary photo files expire after a certain period of time. That been said, please keep the original copy of photos even after you transferred photos from iPhone 8 to Mac. Tips and Notes: If you have an HEIC/HEIF photo on iPhone and would like to convert HEIC to JPG before sending them to a non-Apple device, email the picture to yourself is a good way-out as the photo you download will be automatically saved to JPG. As the default photo APP for iPhone and Mac, iPhoto is another option to transfer photos from iPhone 8 to Mac when cord-connected. It virtually is the most easy-to-use function that support photo transfer, which prompts out once an iPhone is recognized. After scanning and showcasing the whole iPhone camera roll tidily, iPhoto empowers you to select and import the photos. Another option will follow up, inquiring you whether or not you want to delete the imported photos from iPhone 8, and you may choose accordingly. Another question bothering iPhotos users, alongside how to transfer photos from iPhone 8 to Mac, however, is where to find the imported files. Here you may just visit Users > Pictures for the imported albums, selfies, etc. iPhoto App can work on OS X Yosemite 10.10.3 or earlier to help you transfer photos from iPhone to Mac. For newer Mac OS versions, you may use its latest counterpart - Photo APP for photos transfer. If you have an iPhone X/8/7 Plus/7 powered with iOS 11, chances are that you might be getting all your photos in HEIC - then probably you'll need to take a look at top 3 HEIC converters. Have you found out a suitable way to import photos, pics from iPhone 8 to Mac macOS Mojave? Though DearMob's iPhone Photo Manager doesn't have its Mac version yet, it won't keep you wait for long before DearMob's Mac transfer solution come out. However, if you're a Windows user, why not use DearMob iPhone Photo Manager to not only import & export photos, but also create new albums, delete added photos, etc. Click to download it below and free up iPhone memory to take more interesting pictures! Easiest way to backup iPhone contacts to Windows 10 is DearMob iPhone Manager – which not only facilitates iphone contacts backup without losing any of them, but also helps you with the backup of other important data like SMS & calendars. How to transfer old iphone to new iphone now that you've got the shiny new iPhone X new model? This guide introduces fastest ways for you to either transfer everything from old iphone to new iphone. macOS Mojave Continuity Camera not working when trying to send iOS 12 iPhone photos to Mac? Here is the best solution when you want to transfer iPhone photos to Mac while Continuity Camera doesn't work.